Without a doubt, Yves Baril’s art has been printed more than that of any other Canadian artist. Yet, unless you’re absorbed in the world of Canadian philately or numismatics, you’ve also probably never heard of him. Known for his exquisite and detailed portraiture, Yves Baril is Canada’s master engraver, having produced engravings for more than 146 Canadian postage stamp issues, the Canadian bank notes printed from the late 1950s to 1990s, Canadian Tire money, share and bond certificates, labels and coupons. With millions of these products printed and circulating, and especially for the postage stamps and bank notes, Yves Baril’s work has passed through the hands of many—or perhaps most—Canadians. Born in 1932 in Verdun, Quebec, Yves Baril grew up in Montreal’s southwest boroughs and studied the arts, including painting and typography, at the Montreal Museum of Fine Arts School and the Montreal School of Graphic Arts. Following his graduation, Baril would take up an engraving apprenticeship in 1953 in Ottawa with the Canadian Bank Note Company, Limited, a private printing company specializing in bank notes and security documents. Studying under master engraver Silas Robert Allen, Baril began by attempting to mimic the work of his teacher. His break came in 1955 when the Post Office Department rejected the engraving made by Allen for a stamp commemorating the immigration of homesteaders into Saskatchewan and Alberta. It was too late in the production cycle to start over, and in desperation Baril’s engraving was submitted as a substitute. Perhaps to everyone’s surprise, and to Allen’s chagrin, the Post Office preferred Baril’s version and accepted it, launching Baril’s career as an engraving artist. 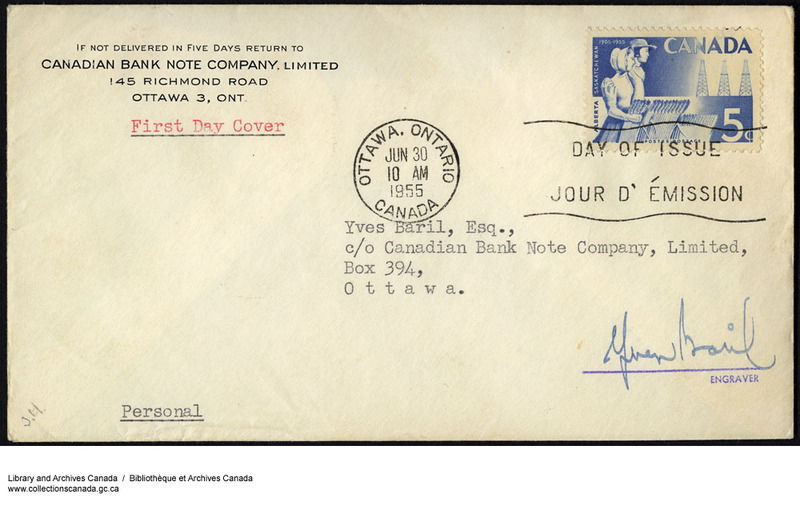 Yves Baril’s autographed first day cover for the 1955 Alberta and Saskatchewan postage stamp he engraved, June 30, 1955 (MIKAN 3951112). 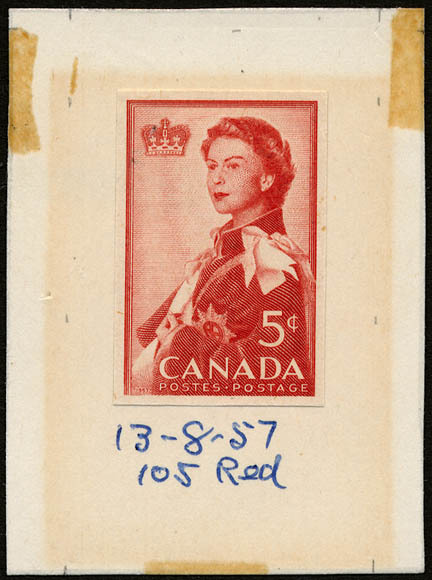 Copyright: Canada Post Corporation (postage stamp), assigned to LAC (autograph). Baril would spend the rest of his career with Canadian Bank Note, developing his craft with additional training with its parent company, American Bank Note, in New York City, and with its subsidiary, Bradbury, Wilkinson and Company, in London, England. 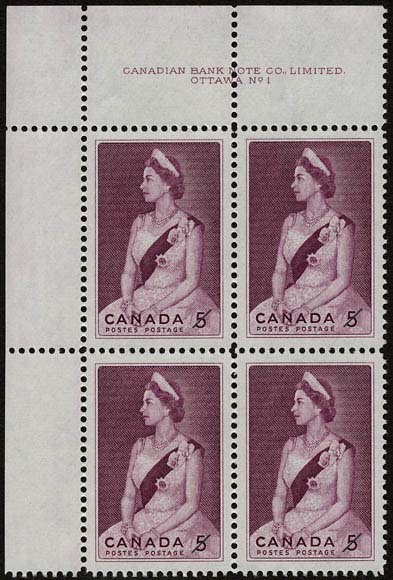 In addition to Baril’s work on Canadian postage stamps, bank notes and company coupons, he is also credited with engravings for six United Nations postage stamps (used for sending mail from UN offices) and eleven United States postage stamps. His most notable work was in portraits of Queen Elizabeth II for postage stamps commemorating the royal visits in 1959 and 1964, based on a painting by Pietro Annigoni and a photograph by Anthony Buckley, respectively. These portrait engravings each required hundreds of hours of work and the Queen’s personal approval of the final product. Colour trial die proof for the 1959 royal visit (MIKAN 2212875). Copyright: Canada Post Corporation. In 2009 and 2015, Yves Baril made donations of his archival material to Library and Archives Canada. These donations include log books that note which days and for how many hours he worked on each engraving, his own commentary on his work, commemorative first day covers for the issue of postage stamps featuring his work, and an album of philatelic treasures collected from material disposed by Canadian Bank Note. All of this material is available for consultation at Library and Archives Canada in the Yves Baril fonds. Also held at Library and Archives Canada in the Post Office Department fonds (RG3 / R169) are hundreds of other records related to the work of Yves Baril, including hundreds of proofs printed from his engravings and many of the original steel dies he engraved that were used to make printing plates for postage stamps. Entry from Yves Baril’s commentary notebook on the 1973 caricatures postage stamp issues (MIKAN 4868428). Copyright: assigned to Library and Archives Canada. 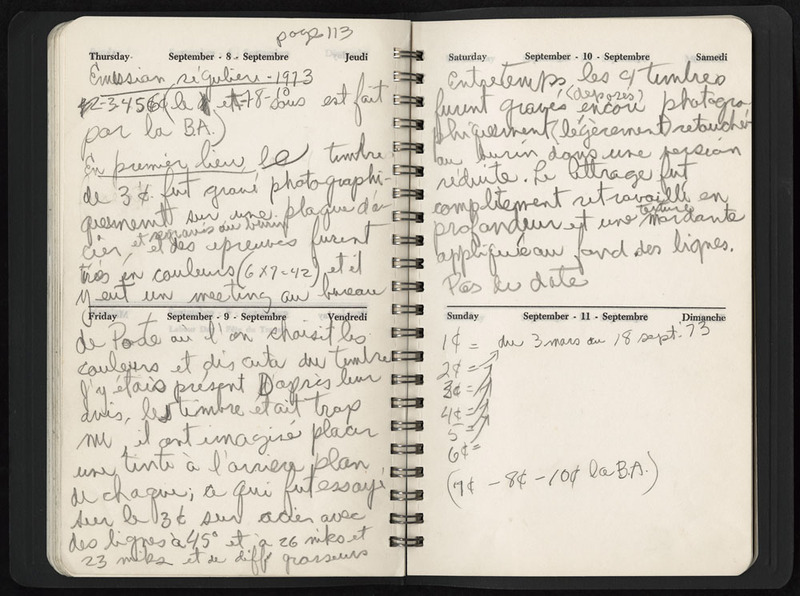 Yves Baril recently visited Library and Archives Canada to discuss his fonds. While here, he spoke about his training, apprenticeship, work and experiences as a Francophone based in Ottawa through the latter half of the 20th century. He also showcased some of his other personal projects, including a steel die engraved to recreate Canada’s first postage stamp, the Three Pence Beaver, and a suite of engraving tools that he made by hand in the 1950s that are still functional today. 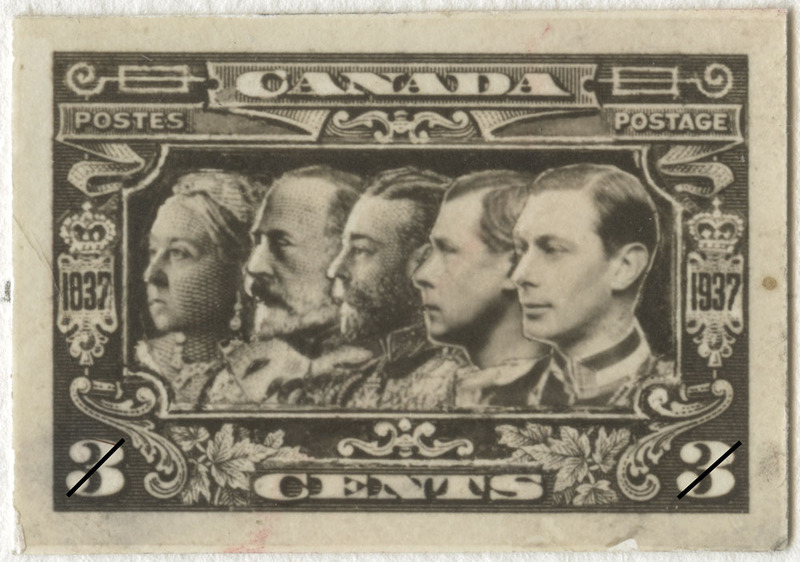 Design essay for an unissued postage stamp found in Yves Baril’s album featuring the British Monarchs from Queen Victoria to King George VI, including King Edward VIII, whose image does not appear on any Canadian postage stamp (MIKAN 4877973). Copyright: assigned to Library and Archives Canada. James Bone is an archivist in the Private Specialized Media Division of the Private Archives Branch at Library and Archives Canada. This entry was posted in Our Collection and Facilities and tagged Philatelic documents, philately, stamps, Yves Baril by Library and Archives Canada Blog. Bookmark the permalink.